The Dodge Fathers won Alpena CC softball's dodgeball fundraiser Friday night. Alpena, Mich — We’re still a few weeks away from the official start of softball season, but the Alpena CC Lumberjacks softball team is already planning for the upcoming season. 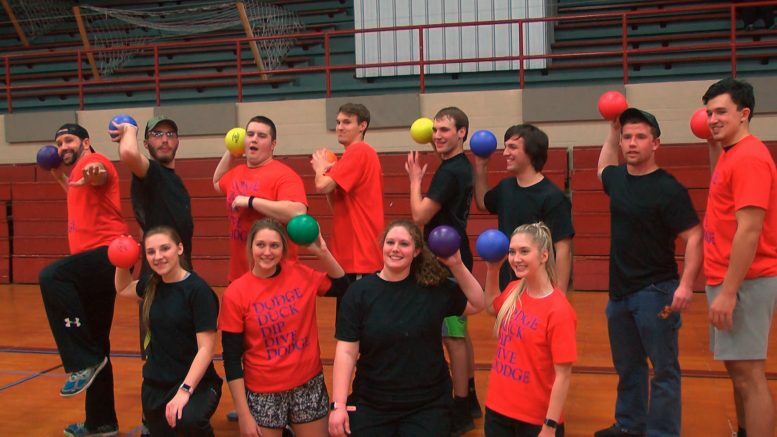 The team hosted a dodge ball tournament as a fundraiser ahead of the 2019 season. The players handled all of the organizing and arranging themselves. Head coach Christen Sobeck was proud of the way the team came together to do this and help out ahead of the season. In addition to the tournament, the team is also hosted a bake sale. The fundraising is for equipment, uniforms, travel, and other season expenses. The tournament was broken into two brackets: youth and adults. The weather limited youth participation to only three teams, while the adult league featured eight total teams. The winning team, named “The Dodge Fathers,” featured Harry and Logan Guthrie, Cam DeCaire, Barrett “.50 Cal” Jones, Jess Marwede, and Lexie Ferguson.